Welcome, welcome new friends and old. I would like to take a quick minute to show you all my entry into this season of Sewvivor. Fair warning, picture overload is about to commence! There she is, in all her unfinished glory, my proudest quilty achievement! My Gypsy Wife! That's right, still not finished. I really underestimated how long it would actually take to hand quilt this. I was positive it would take a month or two tops. Wow, so wrong. I've been at it almost four months now and i still have quite a ways to go yet. I did however manage to get enough quilted to finally put the binding on. I was hoping to have it finished in time to use it as my entry for Sewvivor 3. (that was after i was hoping to have it finished for Bloggers Quilt Festival!) So on a whim, i thought i'd email Rach at Family Ever After (superstar host of Sewvivor) and see if it was okay to use semi finished projects. You have no idea how ecstatic i was when she emailed me back and said it was okay! I hustled and bound the half of the quilt that was fully quilted and thought i'd be fine with it. Nope. No way i was going to post my very first full shot of my Gypsy Wife with only half a binding on. So i pulled out my tools of the trade and desperately tried to get as much stitched as possible! I did my best to get at least some of the bigger blocks partially quilted so there would be minimal movement once they're fully quilted. Fingers crossed it doesn't all go to pot when i finish the quilting!! I've really, truly enjoyed hand quilting this. Though i should have timed it better so the quilting portion was being done in the winter. Sitting under this sucker in middle of the summer is like wearing saran wrap in a sauna, blech! I probably would have been done the quilting had i gone with a simple design or even just straight lines. But all the Anna Maria Horner prints were begging for special treatment! Others are left to shine without the grand details. For my very first foray into hand quilting, i think i'm doing pretty well. My stitches could definitely be better, but slowly i'm getting there. And i think by my next hand quilted project (and believe me, there will be more!) they will be better yet! I wish you all could feel the texture that the quilting is giving this, so awesome! And the mix of super dense quilting with random embroidery work and sparse quilting is making for a pretty interesting back! And you can see on the left hand side of the above shot is where all of my blocks have been finished. The right, not so much. And i love how you can see where the strips at the bottom of the quilt are on the back. Quilting them was some of my favorite work. The pattern is the fantastically crazy Gypsy Wife by Jen Kingwell. And if ever i was to design a pattern that best shows who i am, this would have been it! Most of the fabrics were gloriously fussy cut Anna Maria Horner prints, from multiple lines. Mostly Field Study and Dowry, but there are some bits of Hand Drawn Garden in there as well. (You have no idea how badly i wanted to start over when i had Pretty Potent in hand!) And for the most part, most of the low volume prints are Carolyn Friedlander, goddess of the low vol prints! I used AMH Cracking Codes in Petal for the binding and i definitely want to add yardage of it into my stash! All of it was pieced by me on my little old Ken, using whatever colour of Aurifil i had loaded in at the time. Mostly Dove Grey though, that colour is the best neutral thread ever! Aurifil #2975 - Brass. I love this colour so very much! Gypsy was quilted entirely in this shade in 12wt. Though i do also have it in 40wt as well and used that for hand sewing the binding down. I want to quilt all the things in brass! I have my fingers crossed that i make the cut for Sewvivor but i guess we'll have to wait and see! Though even if i don't make the cut, you can bet that i'll be there following along with those that do! Lots of awesome entries! High fives for finally kinda, almost, finishing my Gypsy Wife! And double high fives (or would that be high tens?) for bravely getting out of my hobbit hole and actually daring to do something so very out of the norm for me!! Your Gypsy Wife quilt is too beautiful for words. I'm so glad that you posted tons of pictures but I would have been happy to see more. I'm especially curious to see a close up of the quilting/embroidery on the back of the quilt. Truly, I wish I could see it in person. The texture looks incredible. Ooo.. You are inspiring me to get back to mine. Yours is epic. 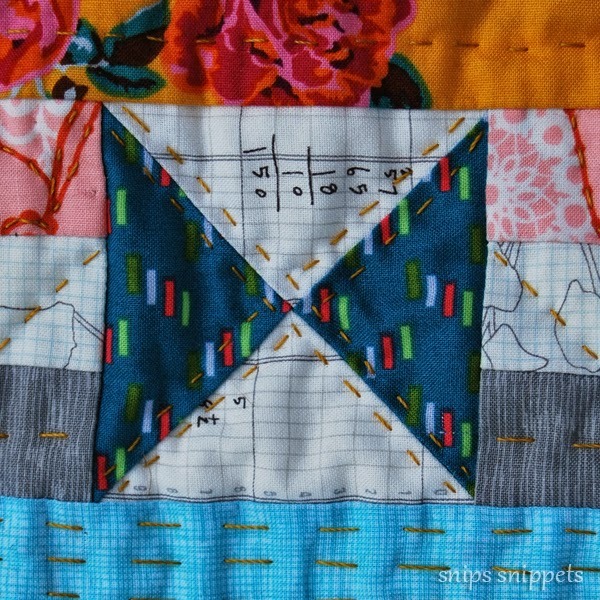 Love all the AMH and the hand quilting details! Good luck! Breathtaking. Otherwise, I am at a loss for words. Truly epic! Oh, this is absolutely stunning! I love your hand-embroidered details, they enhance the fabric wonderfully. wow! just wow!! 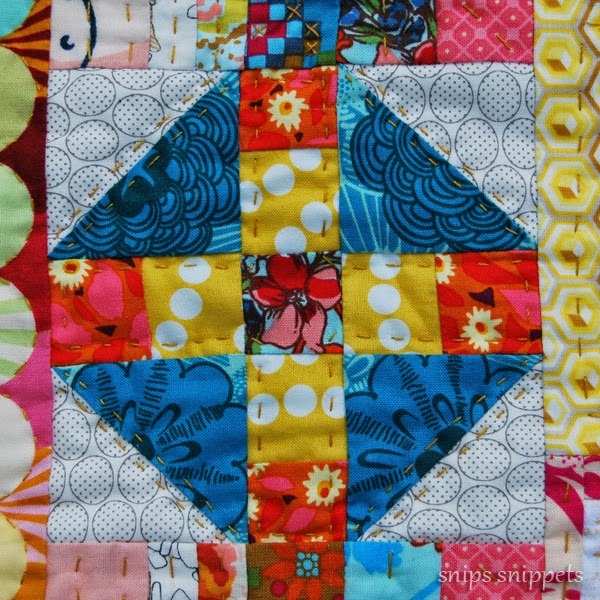 the Gypsy Wife is such a fun pattern and your quilting is such a fun match. i think all of the blocks are getting the royal treatment. and the binding....what a perfect choice!! it really makes the colors in the quilt pop! you know my fingers are crossed for you and Sewvvivor!! Well done Nicole. Those fabrics you went with are perfect for this pattern. Even though it is not my thing I enjoyed exploring all the details and all. LOL... "kept pretty simple" Girl, if that's simple, my quilts are kindergarten! I love that little section of squares that you cross-stitched. I wish I could see this finished quilt in person. It's going to be one of those quilts where you find a new treasure every time you pick it up. 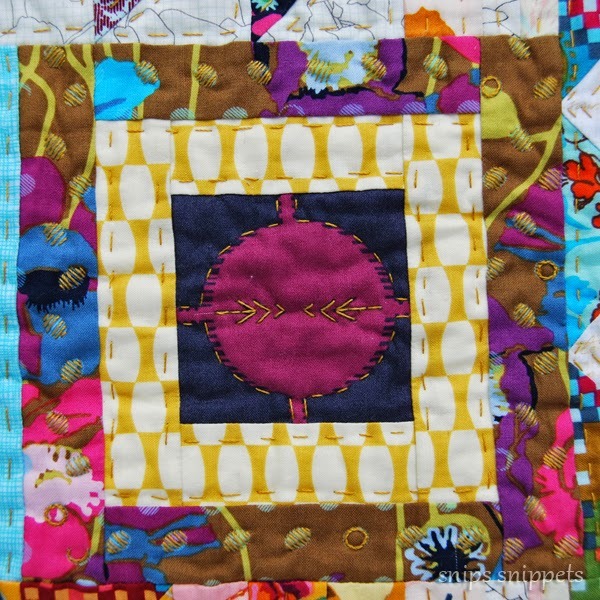 Your quilt is lovely and especially all that hand quilting! Good luck! Ok, so I completely adore this! Truly. It is simply amazing! AMH has never been my most favorite (if you don't want to be my friend anymore, I understand ;), but you've taken her prints and made something I want to stare at forever! And snuggle under. And own :) And you're doing it again with the #brilliantnutbagquilt I am in awe. Fantastic job! This is fantastic! I bought the pattern in April at Paducah for my 'bucket list' quilts! Hope mine turns out as great as yours some day! I love everything about your quilt. Thank you for sharing. i am impressed by your hand quilting skills. i wish that i had half the patience that it would take to consider such a task! I keep coming back to look at your pictures. Your quilt is absolutely stunning, my favourite Gyspy Wife quilt yet. I would have thought that AMH prints are too busy for the pattern--or visa versa--but you skilfully allowed both the pattern and the fabric design to shine with your use of LV prints. Your hand quilting is to die for! Brilliant job--my fingers are crossed for you. NO FREAKING WORDS. NO WORDS. STOP IT. seriously. i am so obsessed. it is stunning. my absolute fav. your colors. can you just send me tons of shots - i want some many of your blocks. LOVE your hand quilting. i just die. this is me giving you a standing ovation, boo! I say high 20s!! This really is as fantastic as I would have imagined when you started with it. Really something special and the handwork... pla dow! Love it Nicole! My computer is being fussy, so after days of trying to see the images in this post, my computer has finally decided I am allowed. I absolutely love the hand quilting. You have done an amazing job. Keep up the good work. You can do it! hOLY SMOKES!! And many, many other synonyms for freaking awesome! I took a look at the competition- there is none. You will win. That is all. *GASP* This is so beautiful, I have no words!! Your hand stitching is so beautiful, and just the right touch for such a magnificent quilt! So beautiful and what wonderful fabrics to be complemented by your hand quilting! I absolutely love this quilt. All the AMH and Carolyn Friedlander goodness in there. Plus, the awesome hand stitching that you have done. It is really beautiful!! Good luck in the Sewvivor! Damn, this is fabulous! Love that you're hand quilting it. Wonderful mix of fabrics. Love! Good luck with the competition! Love love love love love! I want this quilt to come live at my house, except everything else at my house would feel kinda sad and shabby in comparison. It looks great from a distance... you really nailed the mix of values so that all those blocks hold their own. But then there are so many gorgeous close-up details too! Just wow! What an amazing quilt! The hand quilting is so worth it. Beautiful, beautiful, beautiful. I am at a loss for words! Thanks for all the detailed pictures. Love this! I have Gypsy Wife on my wish list. Love the big stitch hand quilting. Awesome! BLAM is right!! Fantastic, Gorgeous, Amazing!! Awesome accomplishments, Sewvivor AND The Gypsy Wife!! 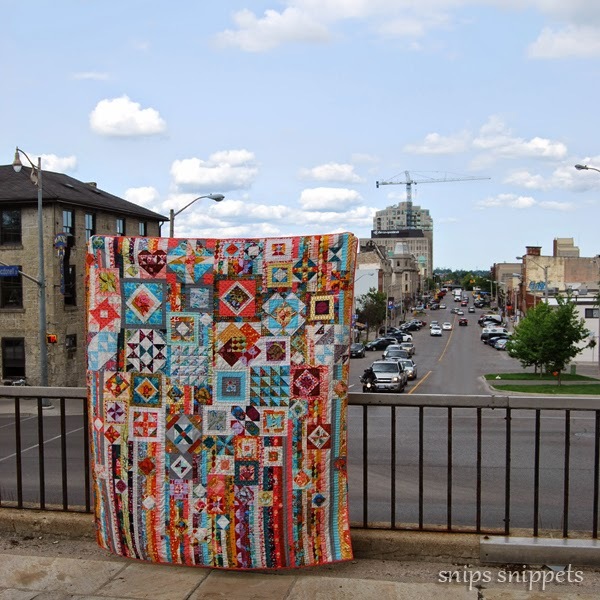 The Gypsy Wife is currently on my Bucket List of Quilty Things, and I'm hording AMH and Tula Pink fabrics until I get to it, then decide. I'll be keeping my eyes out for you during the challenges! Congrats on getting in the final 16! With this quilt you had to be picked! Looking forward to seeing what you come up with for the challenges! I like the mix of stitching. Great idea. Absolutely stunning. Love the hand quilting details too. I pinned yours and one other to a board " Favourite Gypsy Wife" and refer to both often as I'm just starting this quilt. Looking at your photos today I realized we're from the same town! How exciting! Are you a member of the guild?